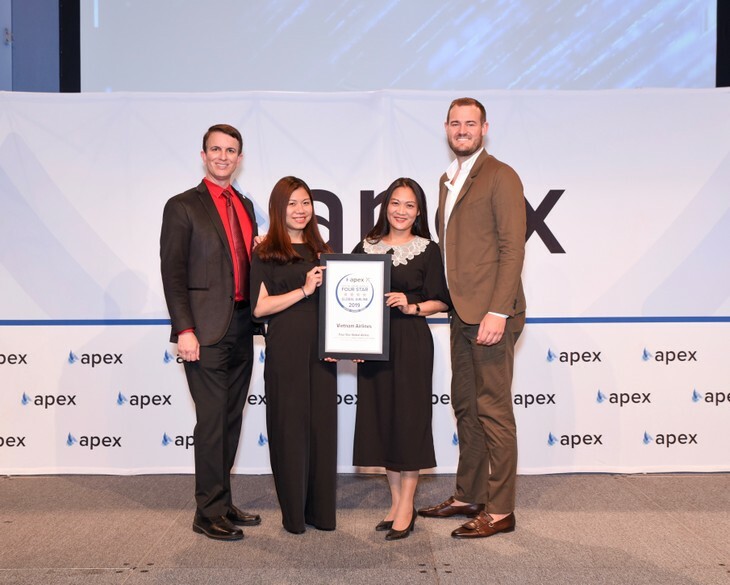 (VOVWORLD) - Vietnam Airlines received the four-star global airline award by the Airline Passenger Experience Association (APEX) at the 2018 edition of Apex Expo in Boston, the US, on September 24th, 2018. Other airlines that won the same four-star global status include Air France, KLM Royal Dutch Airlines, and United Airlines. APEX’s rating program is based solely on certified passenger feedback. The criteria of rating are seating comfort, cabin service quality, food and entertainment onboard, which Vietnam Airlines has improved in recent years. Vietnam’s signature dish, Pho, and seasonal fruits such as litchi and longan, have connected the Vietnamese culture and domestic and foreign passengers. Vietnam Airlines has improved its onboard entertainment programs, doubling the number of movies to 100 in addition to 300 music shows, and 200 TV shows, to meet the increasing demands of customers. Business-class travelers can experience the ultimate relaxation experience thanks to the lie-flat chairs, quilted mattress covers, and pajamas, all in a seating arrangement that offers generous passenger privacy. The APEX Official Airline Ratings™ 2019 were created based on passenger feedback gathered through APEX’s partnership with TripIt® from Concur®, the world’s highest-rated travel-organizing app. Using a five-star scale, more than one million flights were rated by passengers across nearly 500 airlines from around the world between 1 July 2017 and 30 June 2018. Addressing the award ceremony, APEX CEO Joe Leader said only 107 of nearly 500 airlines have attained the four or five-star global status, which accounted for roughly 23%. The rating proves the meticulous detail in passengers’ evaluation of the aviation service quality. He said he was glad that Vietnam Airlines has become one of the few global airlines to receive the award thanks to its improved services. Previously, Vietnam Airlines were honored with other prestigious awards – Four-Star Airline by the international air transport rating organization Skytrax for 3 consecutive years, Travelers’ Choice Major Airlines – Asia 2018 by Trip Advisor, and World's Leading Cultural Airline and World's Leading Airline - Premium Economy Class' by World Travel Awards.